When it comes to tropical drinks, it’s hard to improve on the classics. Though some may attempt, many times their concoctions can become either a carbon-copy of an old one or a tart mix to cover up a bland rum. However, once in a blue moon a new cocktail takes the common tools of a Tiki Technician and whips up a drink that anyone would pass up a common Zombie for. This drink was created by an absolute cocktail prodigy from Las Vegas, whom I met over Yelp when he was the head bartender at I Love Burgers. Being a regular staple of the food and drink scene here, I felt duty bound to weigh-in on this new restaurant. I asked for a cocktail using this new rum I’ve been seeing around called The Kraken. It is an almost coffee-black, spiced rum, most famous for it’s original bottle design and unique nautical style. After a short instant of thinking, he came up with The Black Pearl. Unbutton your top button, belly up to your bungalow bar, and enjoy. 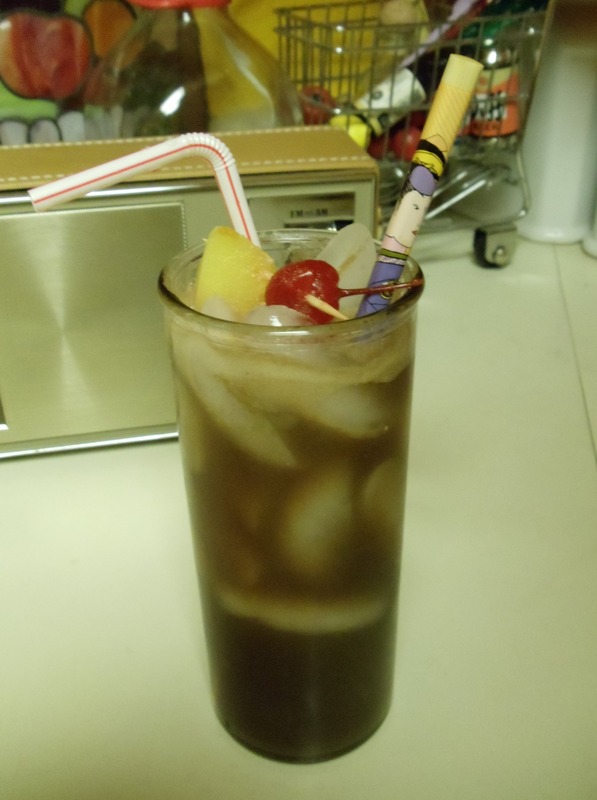 Mix the two rums, pineapple juice, and balsamic reduction in a collins glass. Add a generous helping of ice and top with ginger beer. Pull out your trusty swizzle stick to mingle the ginger beer with the rest of the drink. There is something really special about how these ingredients get together; the pineapple juice doesn’t hide the full-bodied, interesting tastes of the Kraken and the ginger beer only adds to the spice. Take note that it is important to know the difference between ginger ale and ginger beer. While ginger beer does not actually have an alcohol content, it does have a big ginger flavor and is lacking the sugary soda flavor of ginger ale. One of the best brands that uses real ginger and has the good balance between sweet and ginger is Reed’s Extra Ginger Brew. If this drink was only comprised of the rums, juice, and ginger beer, it would be an okay drink. Tasty indeed, but nothing too mind-blowing. That little drizzle of balsamic reduction is the real ace in the hole. Something about this thick, sweet, tangy sauce gets along with everything. Just to experiment, I’ve tried making this drink both with and without the balsamic. It is hard to place, but the real thing it adds is an amazing mouth-feel. It makes everything just so much darker, smoother, swarthier. It makes one long for a smoking jacket, a sandy beach, and the satisfaction from the ruins of a Bond-villain-esque plot smouldering in the sunset. This drink was not named at its inception, but it was recently put on the drinks menu and titled “The Black Pearl”. I would bet that no one would mind a few of these on a voyage to the Caribbean. Whether making one for yourself, a few for some friends, or a punchbowl for a party, this is one drink that is sure to put a knowing smile on your face.